Why see an OT for anxiety? OTs are focused on assisting people to engage in Occupations. Occupations can include daily living skills such as cooking and shopping, self care, leisure activities or study and of course, work. One of the difficulties that people can have in engaging in Occupations is Anxiety. The anxiety can make it hard to get motivated to do it, or some do it but are anxious the whole time or panic, and others avoid it completely. We have made a short video on sensory modulation. This has some quick strategies that can work for anger. In the last few years I have had a number of conversations about Sensory Modulation. 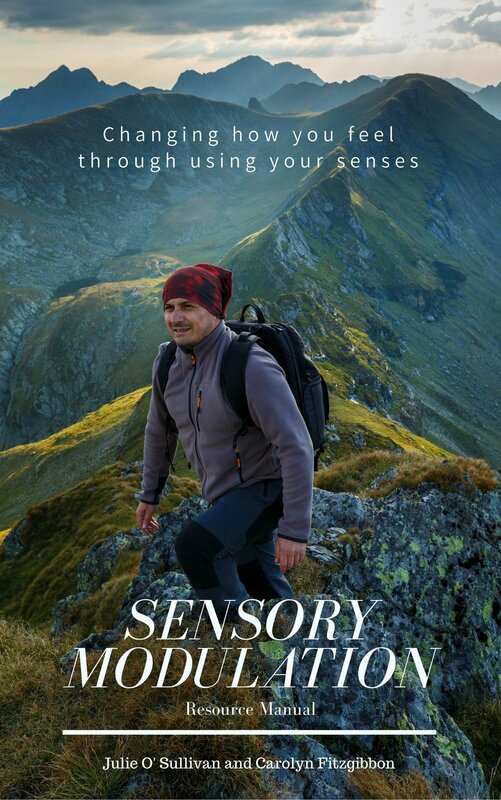 Sensory Modulation is changing how you feel through using your senses. It is a recommended for use in crisis situations in Australia under the National Recovery Plan. There are many people who want to use Sensory Modulation but are not sure how to do it. My colleague, Julie and I decided that we would put together a few resources to be used in training sessions and webinars. We put together so many resources that it turned into a book. This is now available in ebook and also paperback. We hope that you find it useful. The End of the Holidays: 5 ways to keep the benefits. A lot of people have holidays around this time of year. Holidays are a time to relax, to have fun and to do your favourite things. No wonder we are sad when they end! Visualise a relaxing scene eg the beach. Try to recall every little detail: the colour of the ocean, the shoreline, the seagulls or dolphins. Then see if you can recall the sounds of the beach and the smell. This could be something you do every night before you sleep. Put the picture of your holiday up at your desk at work or on a screensaver.When you see this picture, take a moment to connect with the feeling of relaxation. Listen to sounds of your holidays.The sounds of the waves, seagulls, wind and rain are all available in apps, mp3 files and youtube. When you listen to these sounds, try to connect with that feeling of relaxation. Seashells and Pebbles. Touching little momentos of our holidays can be soothing. Some people keep these in their bag or pocket for when they need it. Trying to keep doing some of the activities we found relaxing. For example lie in a hammock, read a book, plan a time every week to spend time relaxing. Mindful eating is the process of focusing our awareness on eating our food. When we do this we can fully savour the experience and can chew and swallow our food well and pay attention to feelings of fullness in our body. To eat mindfully we need to focus on our food which means we need to put down the book and turn of the TV. Mindfulness involves being non-judgemental of our food and so we need to let go of our judgements of food and ourselves and just focus back on our eating. When you first start eating mindfully it may only last for a couple of mouthfuls before your attention wanders. When you notice this, just bring your awareness back to the food and say to yourself "back to the food" without judging yourself. Be mindful of the crunchiness, chewiness, stickiness, salty, sweet, sour, spicy, hot or cold sensations in your mouth. Try to observe the swallowing sensation and the sensations of fullness in your stomach. Mindful eating can be good to do just because it is pleasurable! It is also a useful skill if you have a tendency to over eat, binge eat or struggle with your relationship with food. Happy Mothers Day to all of you beautiful mothers! As Today is Mothers Day I have been thinking about Mothers Day Presents. So many Mothers Day presents are based on the idea of relaxing and inspiring sensations. Think about Foot Baths, scented soaps, flowers, chocolates, fluffy bathrobes, scarves etc. A familiar scent, sight or sound can be very calming and soothing. This can be very useful for many people with dementia can become agitated and anxious. The familiarity of sensations can prompt memories. Smells in particular are very strongly linked to our sense of smell. Think of Cloves and Christmas or GrandMa's lavender. Sensations can prompt conversations without needing other reference points. We can all talk about the lovely print on a teacup without having to remember whose tea cup it is! If you are interested in giving your Mother a Sensory Present then consider your mums preferences in touch and texture (eg wool, silk, fleece, fidget toys) smell (eg soap, perfume, talc, tea) taste ( fruit, spices, her favourite home made recipes) sound (CD's, radio, audio books, musical instruments, ocean or nature sounds, ear plugs) movement, (rocking chair, swing chair if these are safe and not going to cause falls) visual (mini photo albums, art books, memory books, beautiful objects and images) etc. That will be a truly special and helpful present. Next you can think of what sensory sensations you need to calm and relax and get something for yourself. Going for a walk every day can help with depression. In some countries (eg England) exercise is prescribed prior to trialing anti-depressants. The book "spark" has more information on this. And if you are worried about a friend or relative, offering to walk with them everyday can be one of the most effective ways to help them.